Baton Rouge, LA – February 27, 2018 - Lamar Advertising Company (Nasdaq: LAMR), a leading owner and operator of outdoor advertising and logo sign displays, announces the Company’s operating results for the fourth quarter and year ended December 31, 2017. Lamar reported net revenues of $398.5 million for the fourth quarter of 2017 versus $386.7 million for the fourth quarter of 2016, a 3.0% increase. Operating income for the fourth quarter of 2017 increased to $120.0 million as compared to $115.4 million for the same period in 2016. Lamar recognized net income of $87.2 million for the fourth quarter of 2017 compared to net income of $80.5 million for same period in 2016. Net income per diluted share increased 8.6% to $0.88 from $0.81 for the three months ended December 31, 2017 and 2016, respectively. Adjusted EBITDA for the fourth quarter of 2017 was $178.4 million versus $173.6 million for the fourth quarter of 2016, an increase of 2.7%. Cash flow provided by operating activities was $186.4 million for the three months ended December 31, 2017, an increase of $2.4 million as compared to the same period in 2016. Free cash flow for the fourth quarter of 2017 was $112.3 million as compared to $111.1 million for the same period in 2016, a 1.2% increase. For the fourth quarter of 2017, Funds From Operations, or FFO, was $140.0 million versus $126.6 million for the same period in 2016, an increase of 10.6%. Adjusted Funds From Operations, or AFFO, for the fourth quarter of 2017 was $135.8 million compared to $128.9 million for the same period in 2016, an increase of 5.3%. 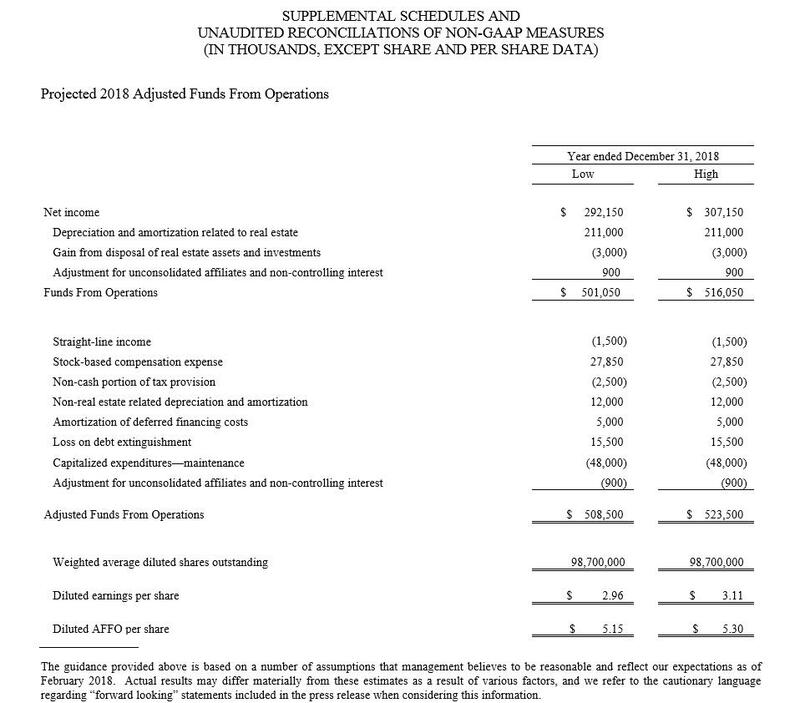 Diluted AFFO per share increased 4.5% to $1.38 for the three months ended December 31, 2017 as compared to $1.32 for the same period in 2016. Acquisition-adjusted net revenue for the fourth quarter of 2017 remained relatively the same as Acquisition-adjusted net revenue for the fourth quarter of 2016. Acquisition-adjusted net revenue excluding Puerto Rico for the fourth quarter of 2017 increased 0.7% as compared to the same period in 2016. Acquisition-adjusted EBITDA for the fourth quarter of 2017 increased 0.7% as compared to Acquisition-adjusted EBITDA for the fourth quarter of 2016. Acquisition-adjusted EBITDA excluding Puerto Rico for the fourth quarter of 2017 increased 1.8% over the same period in 2016. Acquisition-adjusted net revenue and Acquisition-adjusted EBITDA include adjustments to the 2016 period for acquisitions and divestitures for the same time frame as actually owned in the 2017 period. See “Reconciliation of Reported Basis to Acquisition-Adjusted Results”, which provides reconciliations to GAAP for Acquisition-adjusted measures. 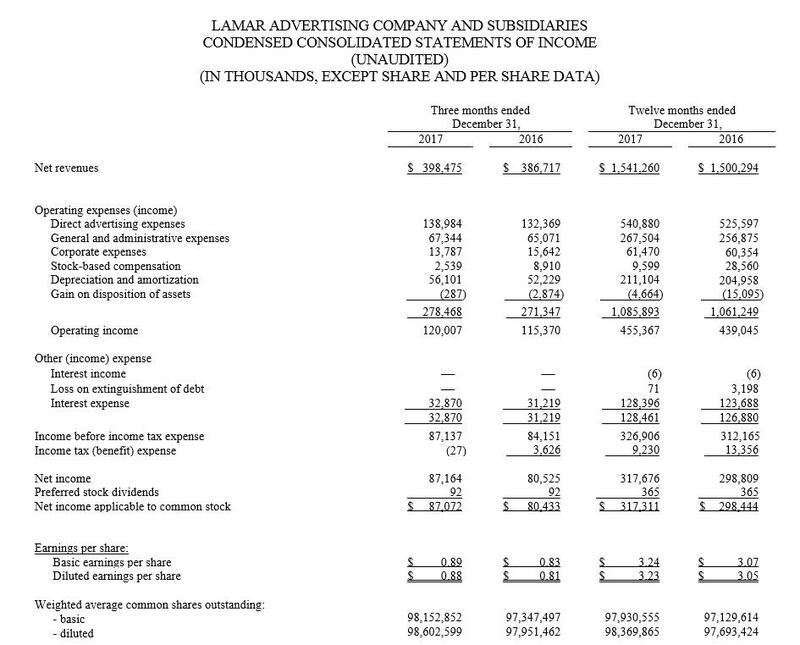 Lamar reported net revenues of $1.54 billion for the twelve months ended December 31, 2017 versus $1.50 billion for the same period in 2016, a 2.7% increase. Operating income for the twelve months ended December 31, 2017 was $455.4 million as compared to $439.0 million for the same period in 2016. Lamar recognized net income of $317.7 million for the twelve months ended December 31, 2017 as compared to net income of $298.8 million for the same period in 2016. Net income per diluted share increased 5.9% to $3.23 for the twelve months ended December 31, 2017 as compared to $3.05 for the same period in 2016. In addition, Adjusted EBITDA for twelve months ended December 31, 2017 was $671.4 million versus $657.5 million for the same period in 2016, a 2.1% increase. Cash flow provided by operating activities decreased to $507.0 million for the twelve months ended December 31, 2017, as compared to $521.8 million for the same period in 2016. Free cash flow for the twelve months ended December 31, 2017 increased 3.0% to $430.0 million as compared to $417.4 million for the same period in 2016. For the twelve months ended December 31, 2017, FFO was $513.0 million versus $475.6 million for the same period in 2016, a 7.9% increase. AFFO for the twelve months ended December 31, 2017 was $496.3 million compared to $488.9 million for the same period in 2016, a 1.5% increase. Diluted AFFO per share increased to $5.05 for the twelve months ended December 31, 2017, as compared to $5.00 in 2016, an increase of 1.0%. As of December 31, 2017, Lamar had $354.6 million in total liquidity that consisted of $239.1 million available for borrowing under its revolving senior credit facility and approximately $115.5 million in cash and cash equivalents. We expect Diluted AFFO per share for fiscal year 2018 will be between $5.15 and $5.30, representing growth of approximately 2.0% to 5.0% over 2017, with net income per diluted share expected to be between $2.96 and $3.11. See “Supplemental Schedules and Unaudited Reconciliations of Non-GAAP Measures”, for a reconciliation to GAAP. On February 16, 2018, Lamar Media announced its intention to redeem in full all $500.0 million in aggregate principal amount of its outstanding 5 7/8% Senior Subordinated Notes due 2022. The redemption will be made in accordance with the terms of the indenture governing the Notes and the terms of the notice of redemption. Lamar Media expects the Notes to be redeemed on March 19, 2018 (the “Redemption Date”) at a redemption price equal to 101.958% of the aggregate principal amount of the outstanding Notes, plus accrued and unpaid interest up to (but not including) the Redemption Date. Lamar intends to fund the redemption through borrowings from the establishment of a new term loan facility under Lamar Media’s senior credit facility (the “Term Loan”). Lamar Media expects to amend its senior credit agreement to establish the Term Loan on or before the Redemption Date. This press release contains forward-looking statements, including statements regarding sales trends. These statements are subject to risks and uncertainties that could cause actual results to differ materially from those projected in these forward-looking statements. These risks and uncertainties include, among others: (1) our significant indebtedness; (2) the state of the economy and financial markets generally and the effect of the broader economy on the demand for advertising; (3) the continued popularity of outdoor advertising as an advertising medium; (4) our need for and ability to obtain additional funding for operations, debt refinancing or acquisitions; (5) our ability to continue to qualify as a Real Estate Investment Trust (“REIT”) and maintain our status as a REIT; (6) the regulation of the outdoor advertising industry by federal, state and local governments; (7) the integration of companies and assets that we acquire and our ability to recognize cost savings or operating efficiencies as a result of these acquisitions; (8) changes in accounting principles, policies or guidelines; (9) changes in tax laws applicable to REITs or in the interpretation of those laws; (10) our ability to renew expiring contracts at favorable rates; (11) our ability to successfully implement our digital deployment strategy; (12) the effects of hurricane Maria in the short and long-term on our business and the advertising market in Puerto Rico; (13) the market for our Class A common stock; and (14) our ability to amend our senior credit facility to provide for a new term loan facility in order to fund our planned redemption of our 5 7/8% Senior Subordinated Notes due 2022. For additional information regarding factors that may cause actual results to differ materially from those indicated in our forward-looking statements, we refer you to the risk factors included in Item 1A of our Annual Report on Form 10-K for the year ended December 31, 2016, as supplemented by any risk factors contained in our Quarterly Reports on Form 10-Q and our Current Reports on Form 8-K. We caution investors not to place undue reliance on the forward-looking statements contained in this document. These statements speak only as of the date of this document, and we undertake no obligation to update or revise the statements, except as may be required by law. 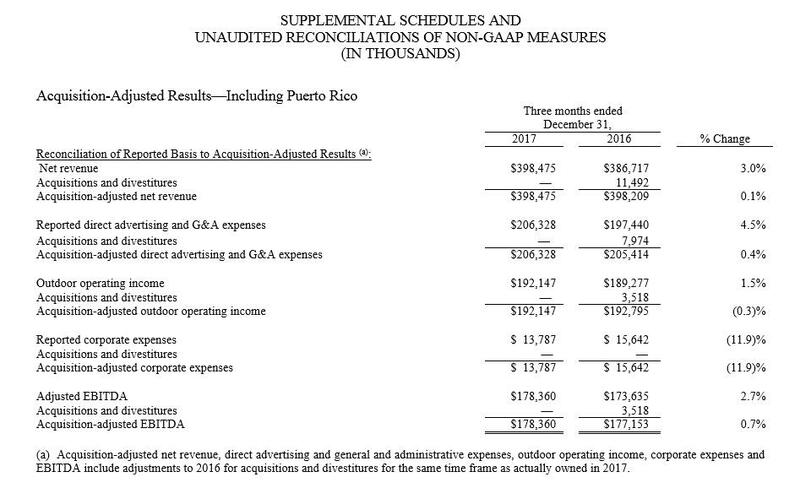 Adjusted EBITDA, FFO, AFFO, Outdoor Operating Income and Acquisition-Adjusted Results are not intended to replace other performance measures determined in accordance with GAAP. 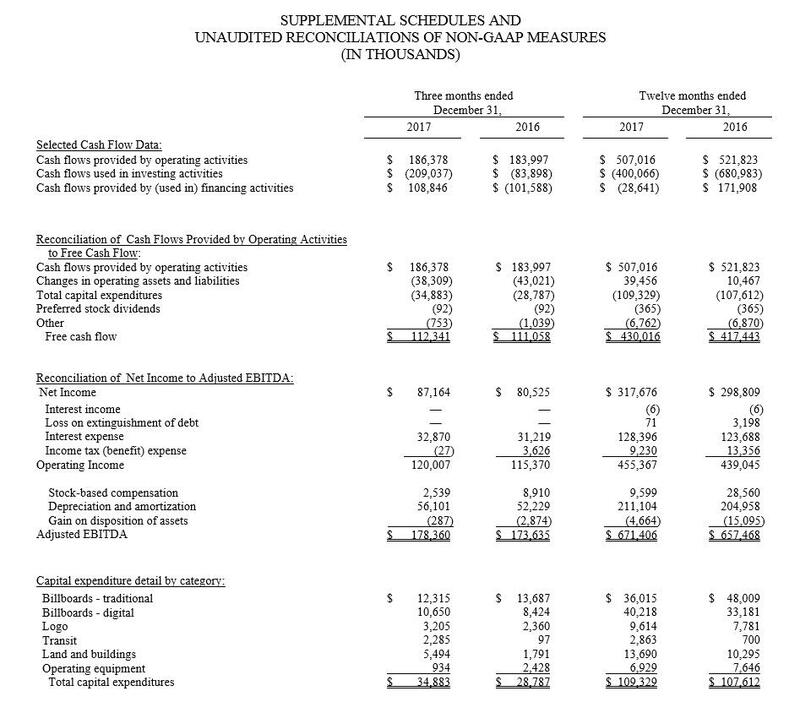 Free Cash Flow, FFO nor AFFO represent cash flows from operating activities in accordance with GAAP and, therefore, these measures should not be considered indicative of cash flows from operating activities as a measure of liquidity or of funds available to fund our cash needs, including our ability to make cash distributions. 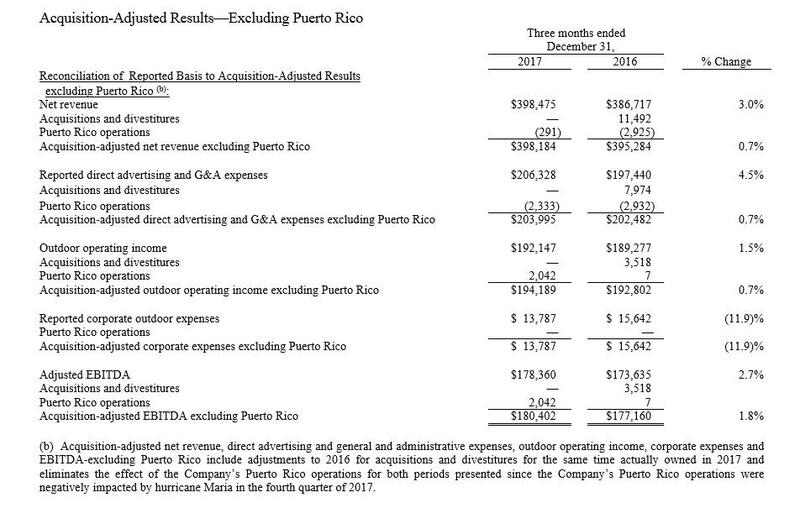 In the aftermath of hurricane Maria, which made landfall in Puerto Rico in late September 2017 and had a severely negative impact on the local economy, we present our Acquisition-Adjusted Results both including and excluding our operations in Puerto Rico in order to enable our investors to evaluate the impact on our business. Adjusted EBITDA, Free Cash Flow, FFO, AFFO, Diluted AFFO per share, Outdoor Operating Income and Acquisition-Adjusted Results are presented as we believe each is a useful indicator of our current operating performance. Specifically, we believe that these metrics are useful to an investor in evaluating our operating performance because (1) each is a key measure used by our management team for purposes of decision making and for evaluating our core operating results; (2) Adjusted EBITDA is widely used in the industry to measure operating performance as it excludes the impact of depreciation and amortization, which may vary significantly among companies, depending upon accounting methods and useful lives, particularly where acquisitions and non-operating factors are involved; (3) Adjusted EBITDA, FFO, AFFO and Diluted AFFO per share each provides investors with a meaningful measure for evaluating our period-over-period operating performance by eliminating items that are not operational in nature and reflect the impact on operations from trends in occupancy rates, operating costs, general and administrative expenses and interest costs; (4) Acquisition-Adjusted Results is a supplement to enable investors to compare period-over-period results on a more consistent basis without the effects of acquisitions and divestures, which reflects our core performance and organic growth (if any) during the period in which the assets were owned and managed by us; (5) Free Cash Flow is an indicator of our ability to service debt and generate cash for acquisitions and other strategic investments; (6) Outdoor Operating Income provides investors a measurement of our core results without the impact of fluctuations in stock-based compensation, depreciation and amortization and corporate expenses; and (7) each of our Non-GAAP measures provides investors with a measure for comparing our results of operations to those of other companies. Founded in 1902, Lamar Advertising (Nasdaq: LAMR) is one of the largest outdoor advertising companies in North America, with more than 348,000 displays across the United States, Canada and Puerto Rico. Lamar offers advertisers a variety of billboard, interstate logo and transit advertising formats, helping both local businesses and national brands reach broad audiences every day. In addition to its more traditional out-of-home inventory, Lamar is proud to offer its customers the largest network of digital billboards in the United States with over 2,800 displays. 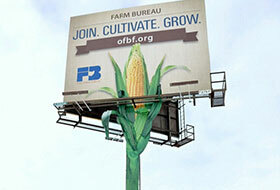 Lamar Advertising of Columbus, in partnership with the Ohio Farm Bureau, has converted a roadside billboard into a giant 3D corn stalk to raise awareness of the grassroots organization, whose mission is to advance agriculture and strengthen local Ohio communities. Situated in Marion alongside US Highway 23, the billboard is intended to drive membership interest and create conversations about the state’s farming and food community.